Dental implants offer more advanced options to solve your missing teeth problems compared to using conventional dentures or bridges. The titanium implant acts act as a natural tooth root. This treatment option also results in a more natural smile, improving your self-confidence and appearance after suffering from missing teeth. Book Your Free Dental Implant Consultation Today! Dental Implant for One Lost Tooth or Several Missing Teeth – A dental implant can restore a smile with one lost tooth with a dental crown, or several missing teeth with a dental bridge. Dental Implants for All Teeth Missing – All teeth lost in a given arch can be restored with dental implants attached to a fixed bridge. Same Day Dental Implants – These are implants which are inserted into the jawbone within the same day that the artificial teeth are attached to the titanium posts, using a minimally-invasive procedure. Dentures Fixed with Implants – Dental implants are used to secure the dentures firmly in place to prevent embarrassing and uncomfortable denture movement. Is a Dental Implant Treatment Suitable for Me? Dental implants are ideal solutions for missing teeth, providing a more advanced treatment option – using high-quality dental implants – than the conventional removable dentures or bridge. 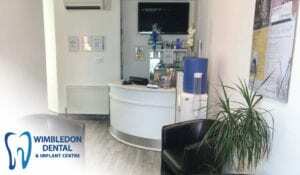 Your caring dentist at Wimbledon Dental & Implant Centre will determine your suitability for a dental implant treatment so you can get the most benefits out of this missing tooth solution. One Missing Tooth – A dental implant attached to a dental crown will successfully restore your smile after you lose one tooth due to various reasons. Several Missing Teeth – You have two dental implant options if several missing teeth are involved: restore the smile with separate crowns supported by dental implants, or with a dental bridge attached to several titanium dental implants attached to the jawbone. All Teeth Missing – If all your teeth are missing in the lower or upper jaw (or both), dental implants will work to restore the healthy function and aesthetics of your smile. Several dental implants can be attached to a full bridge to restore the entire arch. Loose Dentures – Two or more dental implants can be used as anchoring devices for removable teeth replacement such as dentures, while ensuring that it stays securely in place inside the mouth. The implants eliminate uncomfortable and embarrassing problems associated with loose dentures. Our treatments have clear pricing so you can get all the information you need to prepare for your treatment, without any unwanted surprises. We also offer payment plans that do not require credit checks, and 0% finance for up to 10 months.